The questions Kevin decided to raise focus on player contribution in relation to salary. ESPN recently posted an article about salary discrepancy in Major League Soccer. “One interesting fact this article highlights is that two different players in MLS make more per season than the whole roster of 14 different teams,” says Kevin. 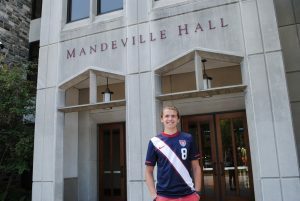 Alongside visiting instructor of sports marketing and sports writer Amie Sheridan, Kevin is evaluating the 2015 Major League Soccer season to create player rankings in an unbiased fashion. A native of Broomall, Pennsylvania, Kevin is also a member of Saint Joseph’s club Gaelic football team, a leader for the Philadelphia Service Immersion Program, a community partner coordinator for the weekly service site at Our Mother of Sorrows soup kitchen/outreach, an APEX participant and a member of the service fraternity Alpha Phi Omega.